STORY: An epidemic of blindness. What a horrible concept. At the very start of Blindness by José Saramago, a man goes blind, waiting in his car at a traffic signal. One moment he has perfect sight, and the next, all he can see is light, pure whiteness. No explanations given. Then, we see the blindness spread like wildfire. The first blind man is taken home by a helpful man, only to be taken advantage of. The apparently kind helper, who ends up stealing the first blind man's car, meets his fate a while later: when he turns blind too. The first blind man, meanwhile, pays his ophthalmologist a visit. The doctor is confused - there is nothing wrong with his eyes, no medical reason why he should be blind. That evening, the doctor discusses his strange patient with his wife. After dinner, while pondering over the case, the doctor goes blind too. All around the city, patients who had been in the clinic with the first blind man lose their sight. The doctor informs the authorities, who once they get over their disbelief, are quick to act. Quarantine. When the ambulance arrives to take the doctor to the quarantine, the doctor's wife is unable to bear separating from her husband. She claims to have also lost her sight and accompanies him to the asylum for the blind. Through the eyes of the one woman who can see, we see the society of blind, as the people descent into savagery, akin to those in Lord of the Flies, but adults, with no one coming to rescue them. STYLE: To give you an idea of the style of writing, let me quote something the doctor's wife, the woman who sees, says. Now we are all equal regarding good and evil, please, don't ask me what good and what evil are, we knew what it was each time we had to act when blindness was an exception, what is right and what is wrong are simply different ways of understanding our relationships with the others, not that which we have with ourselves, one should not trust the latter, forgive this moralising speech, you do not know, you cannot know, what it means to have eyes in a world in which everyone else is blind, I am not a queen, no, I am simply the one who was born to see this horror, you can feel it, I both feel and see it. No question marks, no quotation marks, not exclamation points, no full stops and almost never any indents - that's how the book is written. It is difficult to get accustomed to, difficult to make head or tail of. Take away the order in the writing and we end up, like the people in the book, with a mess that the best of us find difficult to wade through. Like a blind man groping in the dark for familiarity and meaning, we stumble through the labyrinth of words, feeling out sentences, mentally inserting punctuation, trying to make some coherence of the jumble. The style is genius and makes reading Blindness an incredible experience in itself. CHARACTERS: The characters have no names. Fear can cause blindness, said the girl with dark glasses, Never a truer word, that could not be truer, we were already blind the moment we turned blind, fear struck us blind, fear will keep us blind, Who is speaking, asked the doctor, A blind man, replied a voice, just a blind man, for that is all we have here. Then the old man with the black eyepatch asked, How many blind persons are needed to make a blindness, No one could provide the answer. There you go, that's them. The main characters of this book are: the doctor, the doctor's wife, the first blind man, the first blind man's wife, the girl with dark glasses, the man with the black eyepatch, the boy with the squint. No names, just physical descriptions, like identification markers. And they're as evocative as character names can get. You can just picture them by their names. It's convenient; except, irony: they're all blind. While they don't bother with names or outward appearances, all we can know them by is the outer shells. Again: genius. The book plays tricks on you, and it's difficult not to let them get to you. THEMES: I haven't even come close to figuring it all out. I'm still processing, having finished the book only a couple of days ago. For me, the book is about what it means to be human. Watching society as we know it collapse is horrific; but what makes you keep reading is the hope. The little gestures of love, affection and kindness; the old man with the black eyepatch finding love, the first blind man sympathising the man who stole his car. Their white blindness makes the people see the world in a new light, see things for what they truly are. The reason for the blindness hardly matters, and it's never touched upon why that one woman (the doctor's wife) remains sighted; it is understood that they always were unseeing, even when not blind. The book is harrowing, brutally honest and can sweep you up in its wisdom and leave you feeling exhausted and in awe. It's also not for everybody. There is violence. Gory details about things that you'd rather pretend didn't exist are thrust in your face. To read this book, you can't afford to be blind to what's right there in front of you, the book won't allow you that luxury. 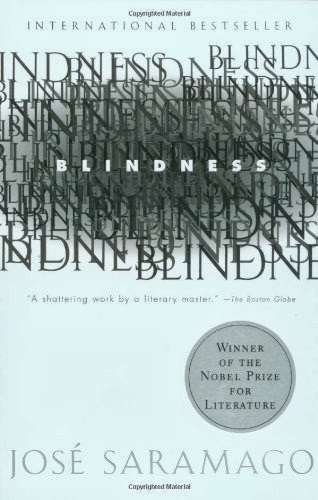 Blindness by José Saramago is not a book you can read in a matter of days, or grasp in one read. It's an effort, but in the end I think it's worth it. It's the first book to actually make me cry. Great book and as you told, require some effort from reader. There is a sequel. Planning to read it. i actually found parts of this book quite annoying. i got tired of the short sayings -they seemed so frequent. i did get a kick out of all the literary references. not that i remember them now... i read the book last year, and it didn't affect me emotionally like it did you. Divers and Sundry - It was a bit annoying for me too, at the start, but then it began to grow on me! I guess this is kind of those you either really love it or you hate it books. How did you feel about the nurse not trying harder to stop some of the terrible things the gang was doing? I read this book a few years ago because I'm drawn towards end-of-the-world stories and I found it both fascinating and disturbing. I enjoyed the book, but didn't expect the ending. I did lie awake at night thinking how awful it would be if something like that really happened.